Benito Mussolini, though, had the more regional role — ever in Hitler’s awful shadow — as Italy’s preening, jut-jawed “Il Duce.” He seems, by now, a caricature of despotism, a thuggish narcissist who led his people to the wrong side of history and paid the price, shot by Italian communist partisans as the war ended, his body hung upside down on meat hooks to what seems eternal ridicule. But as Brown University professor David I. Kertzer makes clear in The Pope and Mussolini, his vividly recounted history, the rise of Italian fascism is a tale of a very different partnering than that of Il Duce and Der Führer. 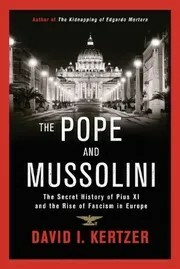 Instead, Kertzer portrays the alliance of Mussolini and Pope Pius XI. Both came to power in 1922, when the destiny of Europe, still reeling after World War I, was unforeseeable, and fascism was viewed as a form of authoritarianism that had its practical advantage for a nation seeking political order and a church that had fallen from its height of influence. Born Achille Ratti in a small town near Milan — where the coarse and unschooled Mussolini had been born to the son of a blacksmith — the bookish, stoic Pius XI rose from the humble rank of Vatican librarian to become an officious pope, a bespectacled cleric whom no one would mistake for a visionary. But he was fiercely loyal to the church, and keenly aware of how the Vatican’s privileges and its stature among the Italian masses had withered during the First World War, under the thumb of a feckless Italian government and monarchy. As Mussolini’s fascist squadristi, the infamous blackshirts, advanced from the countryside toward Rome in 1921, amassing power where socialists and democrats had mainly sown division, it wasn’t long before an insecure King Victor Emamanuel III chose to install Mussolini as prime minister rather than risk bloodshed. Once in power, Il Duce was shrewd in using the church to shore up popular support. Though not a religious man, he courted Catholic approval, as Kertzer describes: “He ordered crucifixes to be placed on hospital rooms. He made it a crime to insult a priest or speak disparagingly of the Catholic religion. … He showered the church with money, including three million lire to restore churches damaged during the war.” He even had his wife and three children baptized. Next Post Are You an Agnotologist?